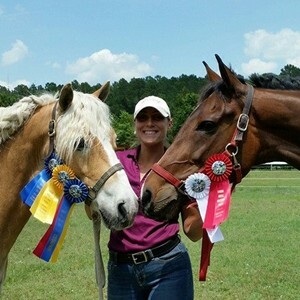 I am the owner and head trainer at Gallifrey Farm, LLC in Pembroke, GA outside of Savannah. Gallifrey is a private Dressage facility, the only of it's kind in the area, and I specialize in training, showing and teaching Dressage. I love my job because of the horses and their people who love them. I love sharing the journey with so many horses and riders through the long and rather tough road of Dressage. There are too many great memories to count from my days at Meredith Manor (as a student and staff), however the best takeaway is the friends. The friends I made at Meredith Manor are my friends for life. I still keep in touch and most of them are valuable contacts in the horse industry. I am known as the trainer in the area you take your horse or yourself to if you want it done right and you want to go far in the sport. Meredith Manor has helped me establish that reputation for myself by establishing early on values, ethics and professionalism. Meredith Manor is hard. The horses are hard, the teachers can be hard on you, the expectations are high, you will lose sleep, you will get discouraged, you will fall off, you will cry, you will make friends or lose friends, you will find yourself. Meredith Manor is hard but the real horse world will be much harder if you don’t fully immerse yourself into the program. This program has over prepared me for my own training facility and successful business. If you push yourself and succeed in here, you’ll make it out there.